Turn your ideas into a reality with Zinger Enterprizes, Inc., your source for professional manufacturing and prototyping services. We work closely with inventors, contractors, and government agencies to develop full-functional prototypes, including storm shelters, rescue craft, and vehicles that run on alternative energy. (888) 330-7217 in Laurel, Delaware, for alternative energy design and development solutions. alternative energy prototyping and manufacturing services. instrumentation. This also facilitates laboratory setups and testing of optical instrument development. Each Platform features a flow-thru system for onboard monitoring. This system can also vary intake depth for water column studies. These platforms are currently involved in Aeration and reclamation monitoring projects 16' LIMNOLOGICAL Platform is specially suited for shallow water projects. With an operational draft of only 4 " it can easily navigate most ponds, lakes, bays, rivers, and even ditches. This platform can operate Multi-mode functions, 1 as a typical manned platform. 2 as a solar powered manned platform. 3 as a solar powered mored buoy. 4 as a solar powered remote/robotic platform. 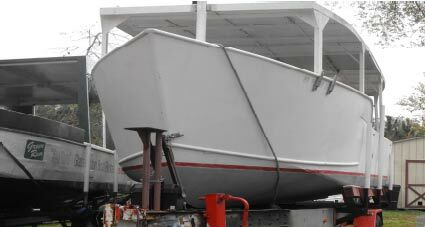 30' Aluminum Coastal/Estuary platform is large enough to accommodate a large project or tour. Solar canopy provides up to 2kw of clean quiet power. Excellent ecotourism platform. 33' Aluminum open water platform. This platform can operate in waters from 24" to Deep Ocean. It is large enough to accommodate a large project or tour. A head and berths (currently removed for aeration studies) provide a little creature comfort for long missions. Solar canopy provides up to 2.6 kW of clean quiet power. 48x72 inch clear viewing areacan be removed for instrument pallet. Large payload capacities, Reinforced hull enables extended use in areas of Coral and thin ice, Modular deck allows for quick customization and installation and numerous accessories make this a very versatile platform.